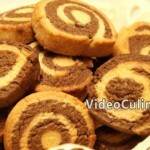 Pinwheel cookies are beautiful and delicious! 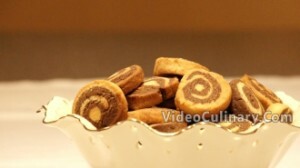 With their spirals of chocolate and vanilla dough – they are perfect for Christmas and parties. 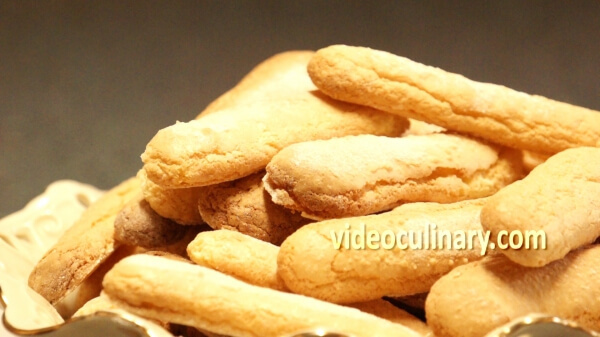 Make the vanilla shortbread cookie dough: Cream together 150 grams (5 oz) of butter, a pinch of salt and 125 grams (4.5 oz) of sugar, until smooth and light in color. Add one egg and mix until incorporated. Sift 300 grams (10 oz) of flour and mix just until combined. Wrap in plastic and refrigerate. 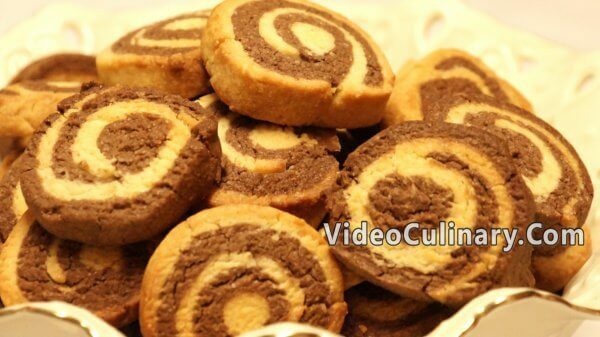 Make the shortbread chocolate cookie dough: Cream together 150 grams of soft butter, a pinch of salt and 125 grams (4.5 oz) of sugar in the bowl of a stand mixer, until smooth and light in color. Add one egg and mix until incorporated. 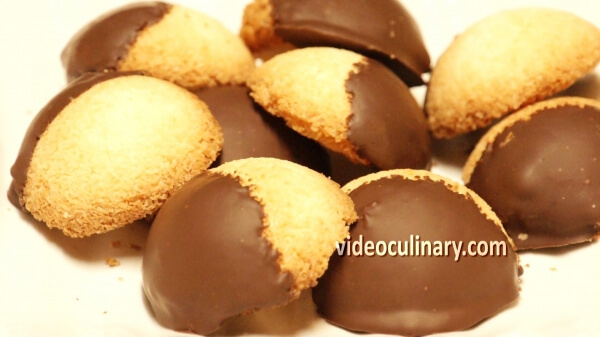 In a separate bowl, mix 300 grams (10 oz) of flour and 20 grams of cocoa powder. 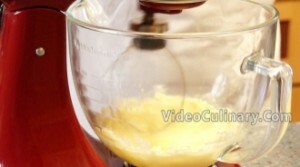 Sift the flour and cocoa powder into the butter mixture,and mix just until the dough forms. Shape into a square, wrap in plastic wrap and refrigerate for 10 minutes. After 10 minutes, remove the chocolate and vanilla dough from the fridge. 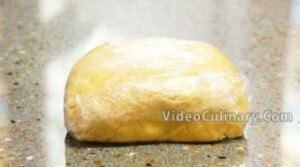 Working in batches, roll the vanilla shortcrust pastry dough into a 4 mm thick rectangle. 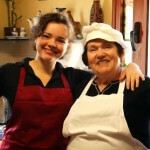 It is easier to roll the dough between two sheets of parchment paper. Trim the edges as needed to create a straight rectangle. 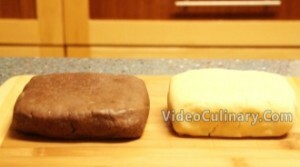 Roll the chocolate dough to the same size. 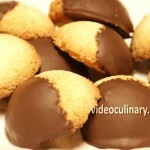 Place the chocolate dough on top of the vanilla dough and gently press to seal together. 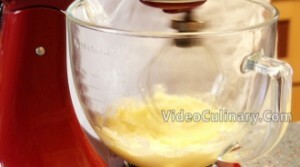 Roll a small piece of the vanilla dough into a cylinder, of the same length as the vanilla and chocolate dough. Place along the long side and roll the dough into a tight cylinder using parchment paper. 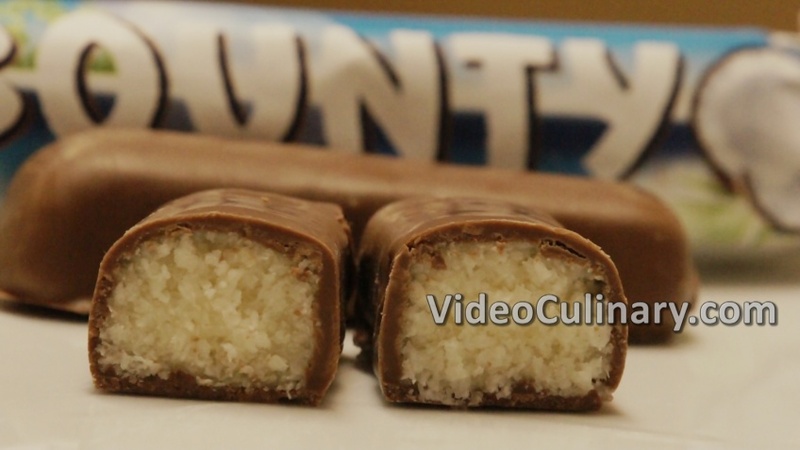 Wrap tightly in parchment paper and refrigerate until firm enough to slice. 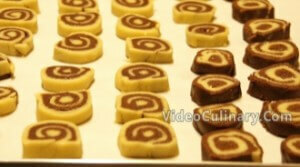 Slice into 5 mm (0.2 inch) thick pieces and arrange on a sheet tray lined with parchment paper. Bake at 200°C (390°F) for about 10 minutes. 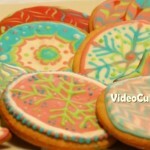 Cool completely and serve these beautiful cookies with tea or coffee. Store in an airtight container.